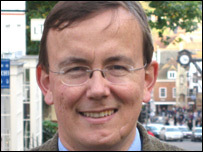 The Liberal Democrats have named a replacement for Winchester MP and former leadership candidate Mark Oaten. Martin Tod, previously a candidate for North West Hampshire, will replace Mr Oaten as a parliamentary candidate when he steps down at the next election. The 42-year-old currently heads the party's online campaigns. Mr Oaten resigned as the party's home affairs spokesman in January of this year after revelations about his private life. The News of the World exposed Mr Oaten for having a relationship with a male prostitute. Shortly before, he quit the Liberal Democrat leadership contest citing a lack of support from colleagues. Mr Oaten said: "I called Martin after the count to congratulate him. "We both worked together as Hampshire candidates before the last election. "I am very very pleased he has been selected and I look forward to working with him." Mr Tod said his first priority is to listen to local people. He added: "An immediate concern is local hospital services. It's essential that they are protected."